Can secular governments stop the spread of radical Islam? Fear of Islam in the West is strengthening the role of Islamophobic and nationalist parties in government. These parties are intent on erecting barriers to hold back Muslim communities in Europe, resulting in greater ethnic tension, division, and even hostility. Governments should more closely monitor developments related to religion, and get involved to the extent that they are permitted by law. 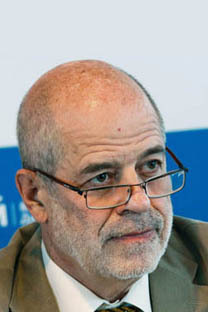 Vitaly Naumkin, director of the Russian Academy of Sciences’ Institute of Oriental Studies and president of the Russian Center for Strategic Studies, shares his thoughts in an interview with Yevgeny Shestakov. Shestakov: Many people in the West and Russia fear Islam. What are the roots of this fear? Can something be done to change this attitude? Naumkin: Let’s look at the situation from a different angle. Is this really fear or is there something else? You could just as easily talk about fear of the West in the Muslim world as fear of Islam in the West. This mutual fear is really just a product of mistrust and misunderstanding. Though, of course, there are major differences between the Western and the Islamic worlds in terms of politics, ideology, culture, and economics. There are too many issues to tackle all at once, so let’s focus on one: Muslim immigration in the West, which has become a mass phenomenon. There are many immigrants from Islamic countries in the West, especially in Europe. They account for more than 5% of the EU population. What’s more, there are problems with all three main approaches to Muslim integration in Europe. The most widespread approach is multiculturalism, which is particularly pronounced in Britain and the Netherlands. In a multicultural society, Muslims are free to preserve their identity, language and religion, and to pass on their religious heritage to their children. In other words, Muslim communities can keep their own cultural identity in a society that they share with many other cultures. However, even this mild approach has not been entirely successful. The terrorist attacks in Britain were carried out by immigrants from Pakistan who had lived in Britain for a long time, received education there, and seemed to have integrated into British society. The assimilationist, French approach holds that immigrants should quickly adopt the dominant French culture, the culture of the majority, and become deeply integrated in it while still preserving their identity. There have been problems with this approach, too. The recent events in France, the unrest caused by young immigrants living in Paris suburbs and other French regions, shows that they have not integrated into French society, and that many are not satisfied with the assimilationist approach. But I won’t go into detail about this now. Then there is the rather utopian, ‘guest worker’ approach, which is seen in Germany. Migrant workers are expected to come, do their jobs and leave. But they have stayed, and Chancellor Angela Merkel recently spoke openly about the problems with this approach. Immigrants in Germany are predominately Turks, who appear to be deeply integrated in German society, though there have been problems. One of the problems became apparent during the transition from the second to the third generation of immigrants. The second generation, the children of Turkish immigrants, has adopted German culture and become part of German society. Yet data shows that these people often have problems finding spouses in Germany, so second-generation Turkish men often marry girls from central Turkey and bring them to Germany. Their wives don’t know their adopted country, and so their children, third-generation Turkish immigrants, still need to be integrated into German society. People belonging to the majority culture are increasingly wary of Muslim immigrants, who naturally want to exercise their legal right to uphold their religious and ethnic identity. And there are other problems caused by, for example, freedom of the press as understood in Europe. I have in mind the controversy over the cartoon of Muhammad initially run in a Danish paper. There’s also the ban on wearing the niqab (veil covering all but the eyes) in France and Belgium. There have even been attempts by the authorities in some countries to prohibit girls and women from wearing the hijab (head scarf) in public institutions and schools. There is no uniformity even in Europe itself. That which is accepted in Britain is rejected in France. For example, Switzerland’s decision to outlaw the construction of new mosques, the result of a nationwide referendum, has been denounced by the commission in the Council of Europe that deals with such matters. But the plan is still in place. This fear of Islam has helped to bring Islamophobic and nationalist parties into power, and they are trying to put up barriers to hold back Muslim communities in Europe. This is sowing greater ethnic tension, division, and even hostility between cultures. Sh. : This mutual hostility is contributing to the rise of militant or political Islam, which uses aggressive tactics to assert its identity and fight the soullessness of the West. Do you think we can stand up against this kind of Islam, or this is a war for survival that will never end? N.: No, I don’t think this is a war for survival. In fact, I don’t think there are different kinds of Islam. But there are groups of fanatics who spread ossified ideas and claim the authority to speak for the entire religion. There are divisions within Muslim communities. And there is a powerful movement for renewal, modernization, tolerance and coexistence with other societies. Unfortunately, there is also that militant movement that sees the West as the enemy and exploits political issues to gain power. The most important issue is the Arab-Israeli conflict and the occupation of Palestinian lands. The conflict is used to rally supporters of a militant interpretation of Islam, and their rallying cry is the need to end the oppression of Israel and the West. They claim that Palestinians are being discriminated against. They add fuel to that fire by citing examples – whether real or imaginary – of discrimination against Muslims: the banning of headscarves, mosques, public prayer and other aspects of Muslim culture. These examples strengthen militant sentiments in the Islamic world and empower radicals who call for war against the West and denounce Western civilization as the enemy. This is not only a divide between the West and the Muslim world, but also between fellow Muslims in nearly all countries, in particular Saudi Arabia, Iran and Egypt. Western attempts to impose its view of the world – even if in the name of positive things like democracy, modernization and international cooperation – often play into the hands of extremists. The extremists claim that the West is doing this to assert its power and to force Muslims to act in a certain way, and that the West is hostile to Muslims and Islam in general. There are a number of theories explaining the origins of extremism and terrorism. Some look to poverty and underdevelopment, as well as structural causes such as high unemployment, which leaves a lot of young people without anything to do. Other theories cite political reasons, such as the wars waged by the West, attempts to force the Western ways of life on others, and economic pressure. And lastly, some theories point to ideological causes. There is a set of ideas about Islam, some of them popularizing violence and intolerance of both other religions and Muslim dissidents, and encouraging their extermination. The abominable treatment of women by some groups, for example, has been protested not only in the West but also in Muslim countries. Sh. : Can a democratic state stand up against radicals, or can only an authoritarian police state do this? Maybe the problem is that there are no ministries in charge of religious affairs in the West that would monitor what preachers say. We don’t know who is preaching what. N.: We don’t have a ministry like this either, because Russia is a secular state, and a secular state cannot have a ministry in charge of religious affairs. In a way, the situation in Muslim countries is easier in this respect. There are many countries where Islam is the state religion, which means that they have a minister of waqf, or religious affairs, which controls everything. Such countries often have Shariah courts and other elements of state-sponsored Islam. Sh. : But such measures help protect Islam from extremists. Naumkin: Yes, but only if the state takes a thoughtful approach to countering extremism. Look at countries that have endured horrible suffering, such as Algeria. It suffered a bloody civil war in which over 100,000 people perished; it was a massacre by militants from the Islamic Salvation Front. They exterminated whole villages. After learning this horrible lesson, the government created a system that constrained radicals, primarily by monitoring developments in mosques. This was not just a law enforcement operation. It was about promoting Islamic teachings in mosques that reject violence. At the same time, the authorities offered amnesty to former militants and attempted to reintegrate them in society. They launched educational programs for young people led by groups of specially trained intellectuals. The authorities in Algeria did all of that, and as a result some militants stopped fighting and returned to normal life, others were killed, and negotiations are still underway with some groups. Sh. : So you’re saying the government should more closely monitor religious developments? N.: Yes, certainly. The state must intervene to the extent that it is permitted by law. In my opinion, a secular state should use different approaches. The government should get involved but it must not interfere in the affairs of religious communities, as this would violate the principle of secularism. Sh. : What do you mean by different approaches? Naumkin: I mean that Russia, for example, cannot establish a ministry of religious affairs, or decide which mullah is permitted to preach in a mosque. However, we should draft legislation to punish imams for preaching intolerance, violence or hatred of other religions. This must be done; our lawmakers must do this. Maybe we should also do something to prevent young people from going abroad to study at radical schools, and then returning to take positions at mosques in Russia. This is happening now. Some of the mosques here have been taken over by such radical imams educated abroad. Educated in the ideas of “pure” Islam, they reject old customs and traditions and teach young people dangerous ideas. This is very dangerous and very difficult to fight. But the situation is not hopeless. The traditions of tolerant, moderate Islam – which has always been the predominant form of Islam in Russia – should be encouraged in every way possible. Sh. : Can you cite at least one Western country where these approaches have been successfully used? It sounds good in theory, but what about in practice? N.: Of course, there are countries whose experience we should learn from. There are quite a few Asian countries where Muslims are a minority, for example India. There are about 150 million Muslims in India, which is a lot, yet Hinduism is the main religion there. Clashes occur between Muslims and Hindus, but in general the situation is under control. As for the West, I like how Canada has handled this problem. The government there supports multiculturalism and encourages tolerance. I can’t recall any major acts of violence in Canada. France has a special organization, the Council of the Muslim Faith, even though France has a state policy of non-interference in religious matters. The goal of the council is to counteract radical sentiments among young people, which is in the interests of the state. Sometimes it helps to calm passions. Sh. : Do you think there is a double standard toward Islam? For example, there are Al Qaeda sponsors and militant Islamic movements in Saudi Arabia, which is one of the United States’ strategic partners in the region. N.: The Saudi Arabian ruling class is itself attacked by the most radical members of the Wahabbite or Salafite establishment. A great many radical Saudi organizations are primarily attacking the royal family, which they claim has abandoned the ideals of Islam. The conflict between the ruling elite and the most radical part of the Salafite community goes back decades. So, we can’t paint the whole country with a single brush. There are divisions within the society. There is an internal struggle in Saudi Arabia. By the way, there are several different schools of Wahhabism. One of them is more modern and renounces some Wahhabite ideas, such as takfir, which gives a Muslim the right to kill other Muslims for breaking Islamic laws and to fight the authorities if he believes they have betrayed the ideals of Islam as understood by these zealots. There are people in the West who want all Muslim women to take off their paranjas and burqas, but understand that little to no progress is being made on this. So maybe we should let people in, say, Afghanistan live as they want to, so that there can be national reconciliation and a coalition government. Maybe this would be better than fighting a never-ending war. This is one of the questions on the agenda; it is a complex question and it is a part of the problem we are discussing today. Sh. : There is a lot of discussion about discrimination against Islam in the West, while discrimination against Christians in Muslim countries is all but ignored. N.: I disagree. There has been reporting on attacks on Christians in Iraq, many of whom have left the country. During the rule of Saddam Hussein, Christians lived there in relative safety, because the regime was secular, whereas the current regime is religious. Sh. : But Christians are prohibited from gathering in Saudi Arabia. Several dozen Christians were recently arrested there for gathering to pray together. N.: There are no local Christians or Christian communities in Saudi Arabia, and there never have been. The country’s leaders say that Saudi Arabia is “the Land of the Two Holy Mosques.” Missionaries and Christians should not be in this holy land, just as Muslim communities have no place in the Vatican. This is their logic. At the same time, King Abdullah supports dialogue between Christianity and Islam. Isolationist policies are now giving place to a different worldview. I think Saudi Arabia is in for some big changes. Sh. : In short, you don’t believe in an impending clash of civilizations, do you? N.: What I see is a political conflict, first and foremost. I see instances of discrimination, myths and stereotypes coming from both sides. The crisis in relations between the West and Islam is rooted in these misunderstandings. It is primarily a political problem. There are only small signs of a civilizational divide. These signs exist, but I don’t think they amount to a clash of civilizations.